�You are invited to receive a word from our prophetic ministry team. 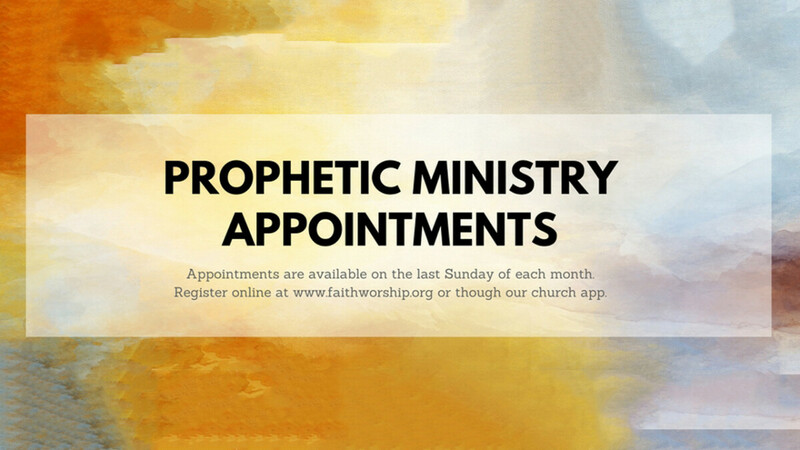 Prophetic ministry appointments are available on the 4th Sunday of each month. You must have an appointment to receive prophetic ministry. There are 6 available appointments each month. If registration is closed, all slots have been filled for the month. The 6 individuals who have registered for an appointment will meet in the hallway outside the ministry rooms. They will be met by Cindy Gale or another host who will give them instruction as to what room to go to. Please note: We can only accommodate a prophetic ministry appointment for each person every 90 days.